Decisions, decisions. Some are easy, some, not so much. In fact, some decisions are so hard to make that we don't make them, we get paralyzed or we ignore the issue altogether. There are many reasons why we fail to make certain decisions, but it is all summarized in one word: fear. When faced with a difficult decision such as moving long-distance, accepting a marriage proposal, declining a job offer, changing careers, divorcing, taking chemotherapy, simplifying life, denouncing criminal activity in an organization, voting for justice and fairness in the face of conflicting values, taking a relationship to the next level, downsizing employees, starting over, buying a teenage son a car, admitting homosexuality and having a child–among other hard life decisions, we all fear something. We fear hurting someone we love, losing, failing, conflict, not knowing what to do and being rejected, lonely, wrong, ridiculed, judged or heartbroken. We all act differently when having to make a choice. Some of us push through without much thought, some of us render ourselves immovable making no decision at all and some us go around and around considering every possibility in order to make a choice and can't. There is a danger in making hasty decisions, in not making decisions and in considering too much in order to make a decision. If we hurry to make the decision, we make it with emotion. We react with what we are feeling rather than respond consciously. If we don't make a decision, a decision will be made for us because a decision needs to be made. This almost never results in the best outcome. If we take too long to make a decision, we will never make the right one. Not in our estimation. Not knowing what choice to make is common and natural. Today is a good day to get over your fears and make a decision based on the information you already have. Have the faith that it will work out for the best for all concerned. You will never have all the information. 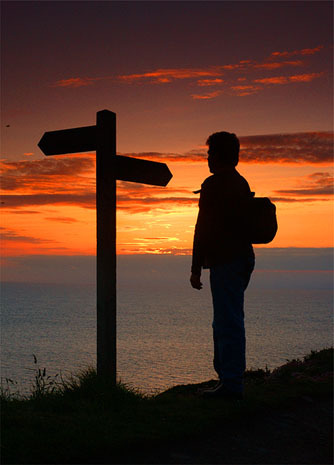 Yet knowing that knowledge is not wisdom, trust in your intuition, find the answers within and make your choice.